Expensive bib shorts are a hard sell. Particularly if you’re buying them ‘in the flesh’ – in the bike shop rather than via the interwebs. Of all the cycling garments (let’s ignore toe caps and knee warmers), bib shorts are the most underwhelming when hung from a clothes hanger. Indeed, the more expensive the short, the more inconsequential they tend to look on the merchandising rail. A bit of shrivelled lyrcra half-wrapped around an odd-shaped piece of foam. I found this when I went into a high end bike shop (Prologue Cycling in Harrogate, in case you’re interested) in the dog days of summer 2017. A voucher (kindly given to me by my sister and her husband) was burning a hole in my saddlebag. The voucher was for a not insubstantial amount. Indeed, the giftors had intended me to use it was a full day of physiological testing with one of the Prologue coaches at a Leeds University facility. Armed with knowledge of my fitness level, I’d be provided with a programme to do something about it. When it became apparent that my attempts to wrangle the family calendar into allowing me to go had failed (had I put much effort in? ), we agreed that I could use it instead to purchase something nice from the Prologue shop. Now, Prologue, befitting its status as a high-end bike shop in Yorkshire’s most teflon of towns, was well-stocked with Castelli gear. 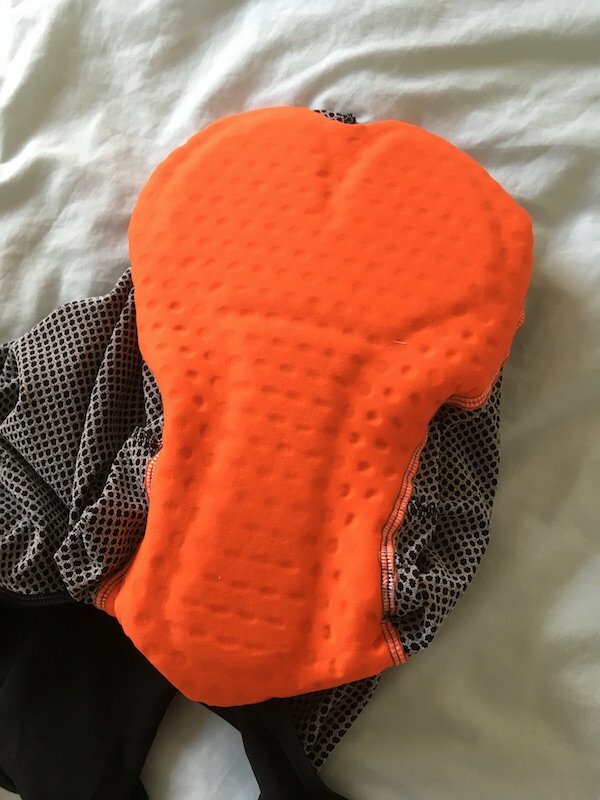 I think I had just bought my Perfetto jersey (online…), and was very much in the mood for treating my undercrackers to a Castelli-cossetting. I had play money (a play voucher) in my hand. But did I buy some Castelli bib shorts? Of course I did …. not. 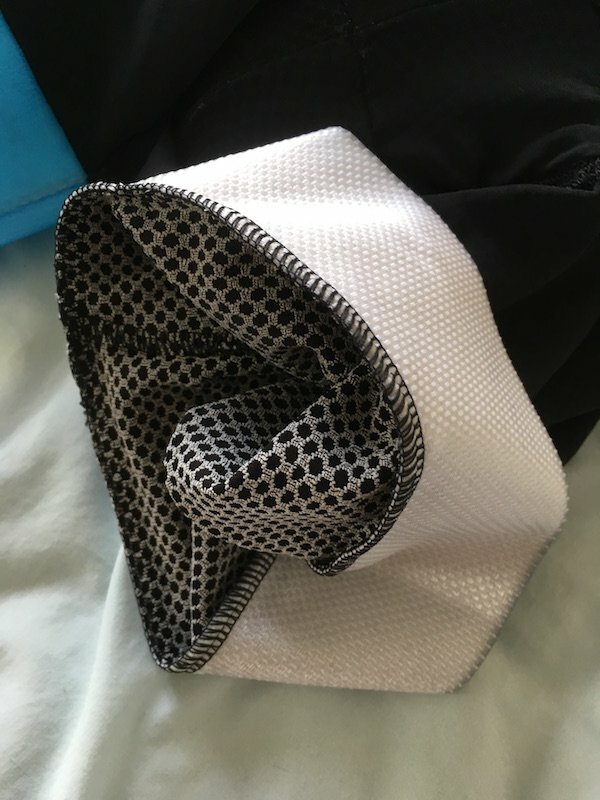 Even with someone else’s money (sort of), it was really hard to spend well north of a hundred quid (they were closer to full retail price than, say, what Wiggle charges), when the item you’re buying resembles a deflated lycra balloon. So I bought a power meter. Which is the start of a different story. The best way to get cycling shorts for free is to agree a cross-giving Christmas list with your equally velo-fancying brother-in-law. (The next best way is to start a cycling blog and try to get cycle clothing manufacturers to pony them up for review, which has happened once). If you’re going to spend big money of your own on a pair of shorts, I’d suggest getting them via the interwebs rather than in person. Clearly this doesn’t work well if you want to try them on, and you actually think you’re going to be able to work out in the shop whether one bum pad or another is going to offer your ’taint more protection. Buying online avoids pre-purchase doubts over spending quite a bit of money for quite a little of short. You can fool yourself with inspiring marketing videos and photos of the shorts being worn by the invisible man. The post-purchase doubts, when the shorts arrive in the post, will hopefully be dispelled when you get them on and feel the benefits of a more expensive bib (maybe). Okay, okay. All I’m saying is that it’s great to receive a pair of bib shorts for Christmas (as part of the bike present swap strategy with my bro-in-law). And this particular Christmas (2017), the gifted bib shorts were Stolen Goats. So what are they, and how are they different? 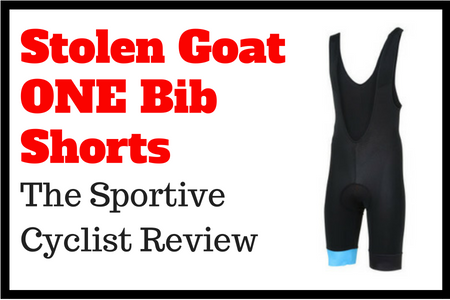 Well, for the most part, the Stolen Goat Bodyline ONEs are a standard pair of cycling bib shorts. They have a shorts bit. They have a bib bit (the lycra straps that go over your shoulders, in order to help hold your shorts up). They have a pad bit (to protect your undercrackers). 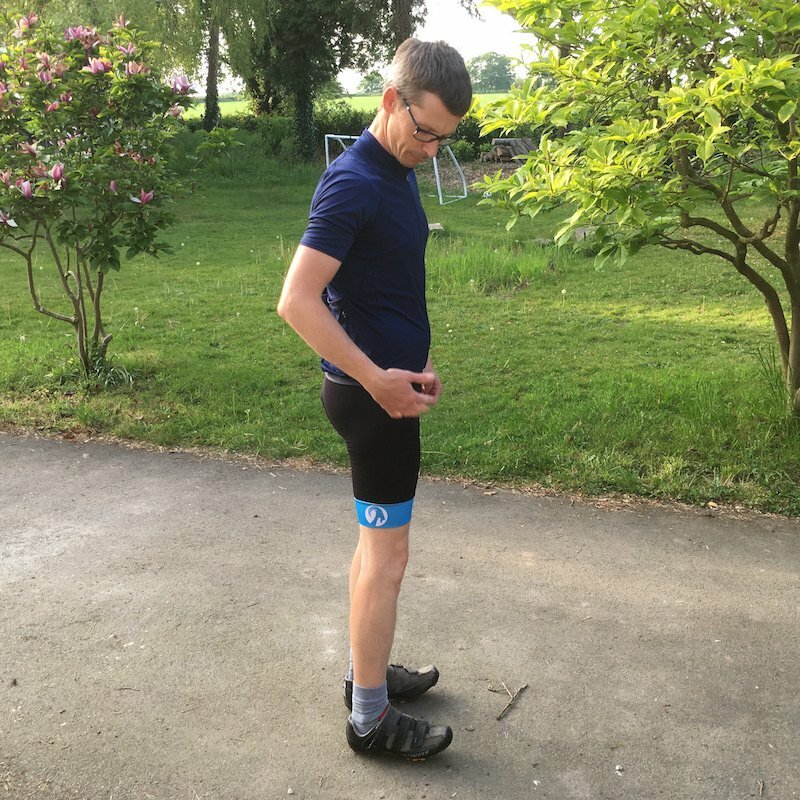 How cycling shorts look and how you think they look with you inside of them, is pretty subjective. So in my subjective opinion, I think the Stolen Goats look good. The design is clean and simple. There is a nice colour detail round one of the thighs (mine is ‘Belgian blue’ – named after the breed of cow – other colours are available). 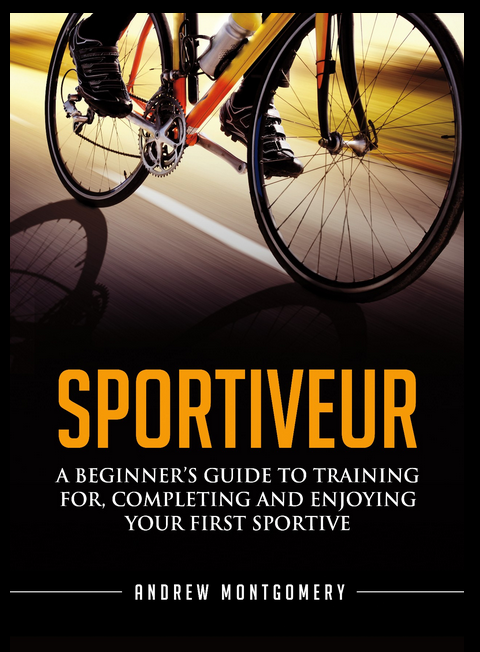 Of key importance for any cycling short is that they don’t inadvertently reveal too much of the rider’s, er… physiology. Despite being made of a soft, lightweight and figure-hugging material, I did not feel overly-exposed when wearing them off the bike. 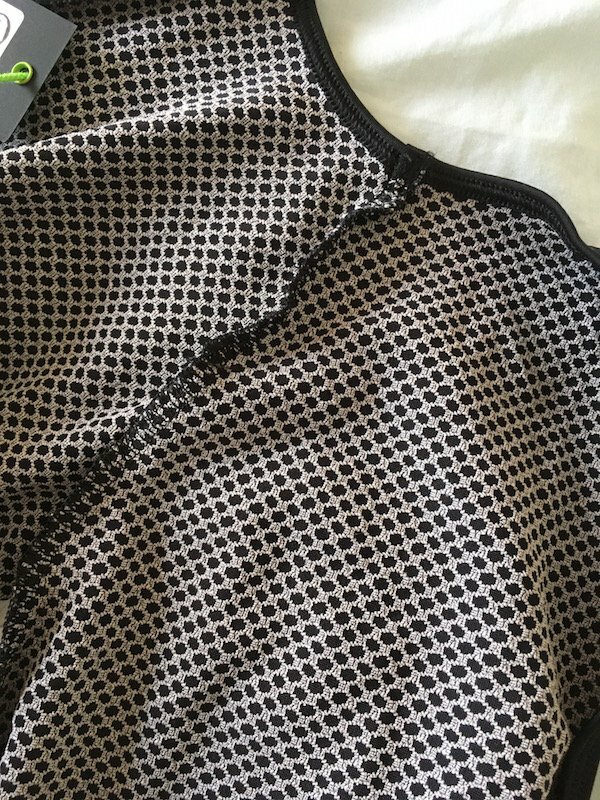 The photo shows the back side of the lycra (the bit that faces the skin). You can sort of see a more subtle version of this pattern through the shorts when you’re wearing them. And I think it looks smart. 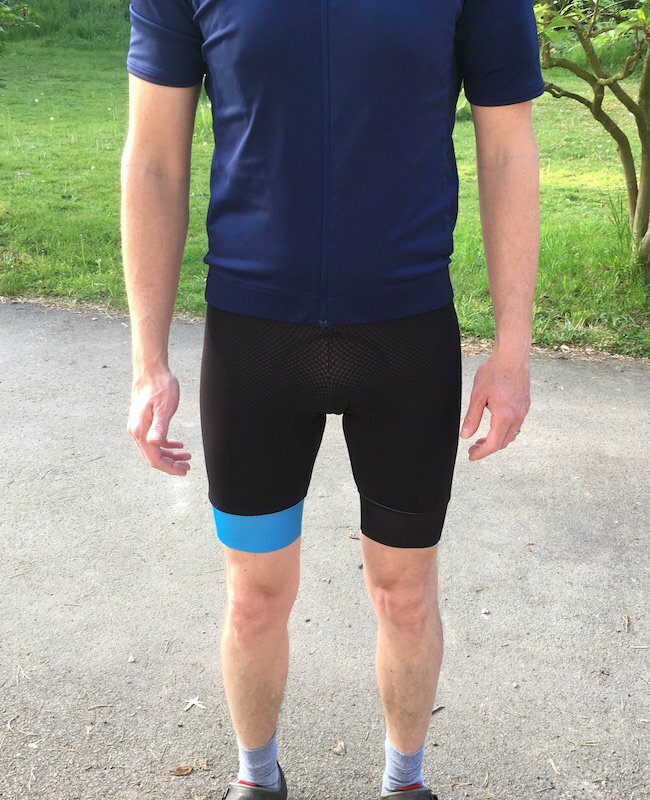 Talking of the ‘thigh cuff’ (I was), the inner surfaces of both the blue and the black ones have the rubbery grippy texture stuff that stops the shorts riding up your leg as you ride. Stolen’s Goat marketing guff (or perhaps ‘gruff’) talks about the fact that the shorts only have one seam. Or ‘ONE’ seam. It depends how you measure it. There is a seam round the chamois pad, where it’s sewn into the shorts, plus a little one up the front (from knackers to belly button, if you’re looking for GPS directions). Even with ONE and a bit seams, the rationale holds true. I have not suffered any irritation from seams whilst riding. Apparently the shorts feature a ‘superior “dimple” chamois pad with perfect placement and antibacterial qualities’. It’s difficult to test these claims. It’s a comfortable pad. It’s a nice orange colour. It has been designed by people that clearly had a puerile sense of humour. Finally, I don’t know if this is a ‘feature’ but after quite a few washes, I can confirm that the shorts still look and feel as good as new. All shorts will wear out eventually if you’re wearing them on a regular basis, but the Stolen Goats, so far, seem well made and robust. Wait, You Want To See More Photos Of Me Wearing The Shorts? The shorts are good but there’s only so much they can do to hold the gut in. I’ll have to work on that by other means. Quite flattering on the glutes though. Box ticked. 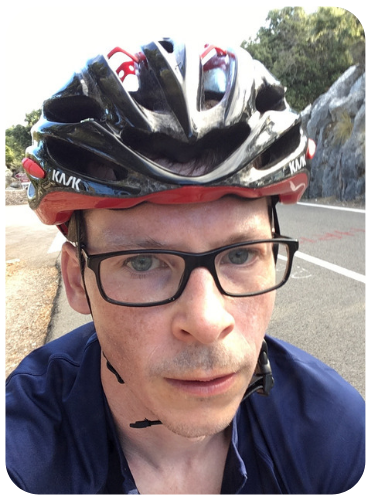 Incidentally, in these photos I am wearing my favourite short sleeved cycling jersey, a dark blue Rapha Core jersey. Another gift from my sister and brother-in-law, I really should have pulled my quill finger out and reviewed the jersey for the blog already. Quick review then: comfortable, lightweight, smart looking and flattering. What Are The Stolen Goat Shorts Like To Ride In? I can confirm that the bright orange pad in a shall-we-say-anatomically-correct shape, has so far performed admirably in its primary function. My nethercrackers have never felt so loved. Talking of nethercrackers, the bib on the shorts is sufficiently stretchy to allow you to pull down the front of the shorts when you need to visit the gents. No need for a full removal of everything on your top half, or to find a route to freedom down one of the legs (who does that…?). The rubberised grippers on the inside of each thigh cuff keep the shorts in position well. As mentioned above in the section on seams (or the relative lack of them), I haven’t encountered any irritation whilst wearing these shorts. Indeed I actually look forward to wearing them. I really like the Stolen Goat ONE bib shorts. I regularly choose them over my other bib shorts, which include some really solid options (my Specialized RBXs, my dhb aeron shorts). Case in point: as I write this review, I have quite a long (~90km) ride with my brother-in-law coming up this Sunday. I’ve worked my bib shorts availability schedule (yes, I have one of those…) so that my Stolen Goat ONEs will be the ones I ride with that day. I don’t think you’d be disappointed to receive a pair, whether as a present (recommended route) or in exchange for your hard-earned cash. 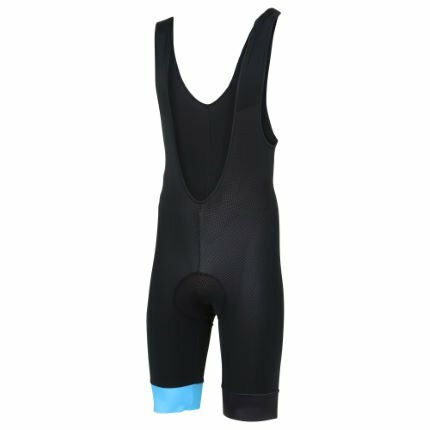 Talking of which, if you do want to deploy some moolah, the Stolen Goat ONE bib shorts are available to buy from Wiggle. Treat your undercarriage to a new garage. With that, I’m away to prepare for this long bike ride (follow me on Strava if you want to see where I ride). So, do you own a pair of Stolen Goat shorts? If not, what shorts do you wear for riding and would you recommend them? That offer didn’t last long they’re £98 now…..
Ah bummer. Will amend the post. Did you try the ones with the blue around the leg? These looked just the job, so I headed over to Wiggle via your link for a trawl. Sadly I discovered the ladies version was £98. 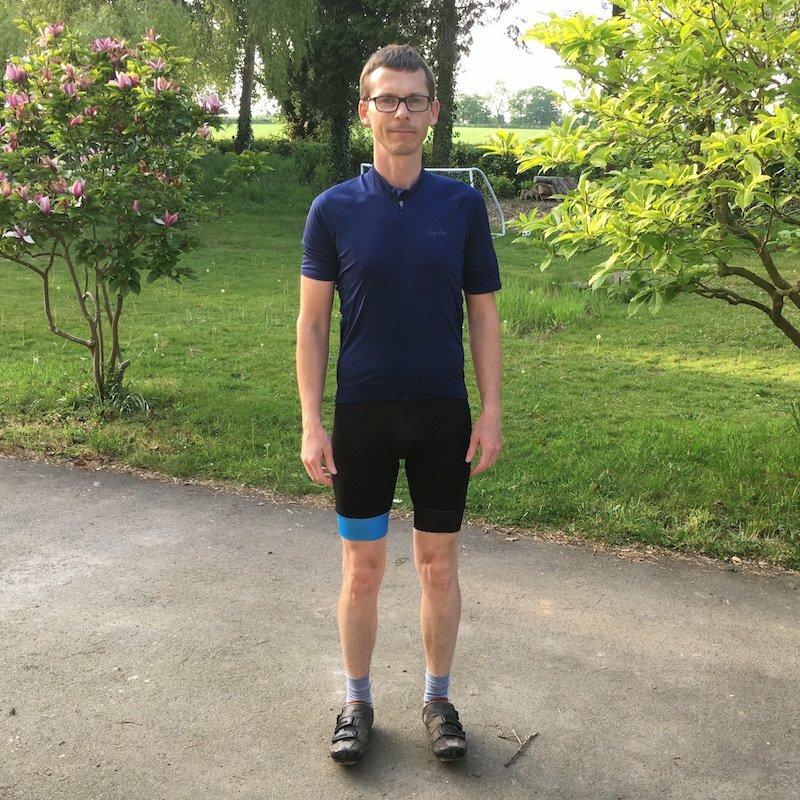 But I do need another pair of shorts and the pad (if it’s flat like the chaps’ version) is perfect for me so I may have to bite the bullet and go for it, otherwise it’s castelli again. (Although Morvelo do a good pad, but I wish their shorts straps were black not white). Went to Wiggle immediately after reading and found price of $165, not the $100 you stated. Thanks Mike. I’ve updated the post. 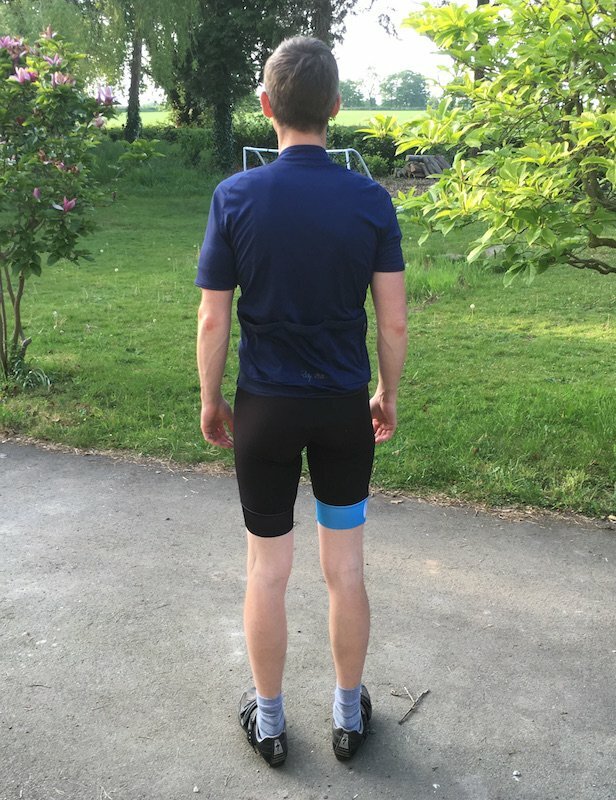 Great post Monty, I have a bit of love the the humble bib short and put them high up on my list of must have items for biking. I will check these out when I’m in the market for a new pair. I recently won a set from One Pro cycling which have filled the void for now…which is nice. I would also like to check out Prologue which I have not done yet and maybe should do since I live in the general vicinity.